The next Presidential election in Sri Lanka is scheduled to be held in January 2020. According to article 30.3 of the Constitution; “the poll for the election of the President shall be taken not less than one month and not more than two months before the expiration of the term of office of the President in office”. Accordingly, if the President wishes, the election can be held within two months after any day preceding November 10, 2019. Despite this provision, article 30.3 (a) of the constitution states that; “Notwithstanding anything to the contrary in the preceding provisions of this Chapter, the President may, at any time after the expiration of four years from the commencement of his first term of office, by Proclamation, declare his intention of appealing to the People for a mandate to hold office, by election, for a further term”. If the president expresses such an interest, the elections commission has to take the necessary steps to call for a Presidential election. 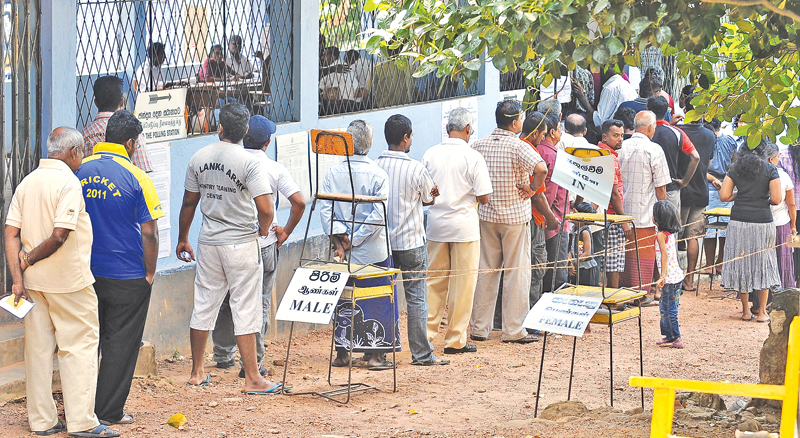 President Sirisena recently made a statement with regard to this and pointed out that he has no intention of calling for a Presidential election prior to the expiry of his term. Therefore, we can come to an assumption that the next Presidential election will be held after December 10, 2019. These days, the discourse surrounding the upcoming Presidential election is centred on who will come forward as candidates to contest the election. The leaders of the SLFP clearly state that the current President will again stand up for reelection. The UNP has also made it clear that Prime Minister Ranil Wickremesinghe will be their chosen candidate for the upcoming Presidential election. On contrary to these, the Joint Opposition is facing a serious political crisis in deciding who their desired candidate is. It is a fact that Mahinda Rajapaksa cannot stand in for re-election due to the constitutional provisions laid out in the 19th Amendment and therefore, the joint opposition has been unable to resolve their political differences and come out with an alternative candidate to Mahinda Rajapaksa based on a common consensus. The JVP has also kept silent about whether they will field a candidate and likewise, the Tamil and Muslim parties too are yet to make statements as to whether they too will field Presidential candidates. On the contrary to all these, the National Movement for Social Justice, which is a civil society organisation states that they are expecting to field in a ‘Partyless’ or ‘apolitical’ candidate for the next Presidential election like in 2015. In the election held in January 2015, the National Movement for Social Justice supported President Maithripala Sirisena. But currently, it is clear that this movement is at loggerheads with the current President. The current President came to power on the promise of being independent but within days of becoming President, he betrayed his own promises made to the civil society and became the President of the SLFP. This is why the National Movement for Social Justice is again reiterating the idea that a ‘Partyless’ or ‘apolitical’ President should be appointed. But it is seriously questionable as to how realistic this whole notion is. A human being, who has an ounce of knowledge about the nature of politics and of the relationship politics has with human beings will definitely understand that the notion of a “Partyless” President is an ultra-utopian idea. This is mainly due to two major reasons. Firstly, the post of President is the highest extremely politicized position in the state above all other administrative officers and it is impossible to carry out its duties and functions whilst being independent or by being “partyless”. Secondly, in a politically organised community, it is virtually impossible to find a candidate who will have no affiliations towards a political party. In order to understand this situation, one must initially understand what is meant by politics and then understand the nature of the relationship between human beings and politics. Generally, the struggle between individuals or groups to capture state power is described as politics. This particular struggle can be either done by following democratic means through elections or through revolutionary methods by using arms and ammunition. Whatever the form this struggle takes, it can be said that politics arose within the human society due to two main reasons. The first reasons is the lack of a common policy and a political ideology in solving political, economic and social problems in a human society. In other words, there is no one common policy or a common agreement as to how these social, economic and political problems can be mitigated because different ideologies approach them differently. These ideologies are usually based on liberal democracy, socialism or social democracy. Secondly, after capturing state power, these policies (whatever the policy is) will be translated into practical action by political actors. These political actors/political activists can be either individuals or political parties. 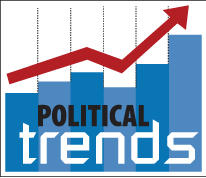 In modern times, political parties take precedence over political actors in engaging in such political activities. Therefore, the emergence of politics is a direct result of the conflict in selecting an ideology which will best solve the problems in a politically organised community. Further, it also becomes evident that an individual who is not bound to these ideologies cannot engage in politics and hence, politics is something which one cannot do in an independent and nonparty affiliated vacuum. So, a person who engages in politics will eventually have to subscribe to liberal democracy and capitalism or believe in socialism and communism or if not subscribe to social democracy. If a person does not believe in any of these ideologies, he/she will at least have to believe in fascism. So, the notion of a “partyless” independent President is an absolute utopian idea that cannot be translated into practical political action. When we take into account the nature of the relationship which exists between people and politics this becomes much clear. Everyone who is born into this world lives and dies within a state. Whenever a human being is born, the initial step is to notify the state and get a birth certificate after registering the birth. Likewise, whenever a human being dies, the most immediate action is to notify the state and get the death certificate. In between these two phenomena, a human being may live for a number of years, but whatever that number is, other than breathing, all the actions performed by a human being is controlled by the state. For example, as stated before, a birth should be registered in the state as soon as a child is born. For individuals, to legally marry, the marriage has to be registered in the state. To give birth a woman must go to a government hospital. For primary education, children must go to a school run by the government. For higher education one must go to a government university. Whenever one is sick, he/she must go to a government hospital. To travel, one must embark on the journey in a government bus or train. When searching for employment, the preference is always given to a government job. When one retires, a pension is paid by the government. For marginalized groups, the government provides welfare. Electricity and water are provided by the government to homes. Eating, wearing clothes and walking on the road also takes place according to the rules of the government. Even, if one is frustrated of life, that person does not have the right to commit suicide as it is illegal. Finally, after all this, when a person dies, it is necessary to notify the state and get the death certificate without which last rites cannot be legally performed. After that, the burial also takes place in state cemetery and if the body is incinerated, that too has to be conducted in a government crematorium. Even after death, the involvement of the state and the government in a person’s life does not end. If the person who died does not leave a last will or failed to transfer the property under his/her name to the next of kin or any other entity, the last decision with regard to that property will be taken according to state law. Even though some of these activities are performed by the private sector, they too have to be carried out according to the laws and regulations of the state. So, from the above description, it becomes clear as to what sort of a stronghold the state and the government has on individual lives. In short, other than the process of breathing, all other elements of human lives are controlled by the state. Even though one might interpret all these as day to day menial functions, when looked at critically, these are directly or indirectly related to politics. A state or a government cannot conduct these activities according to their whims and fancies. They have to carry them out according to an established political and economic ideology. This is why it is impossible to engage in politics without a political party. So all those engage in politics at one level or the other should understand this and not promote utopian ideas that a “partyless” President should be brought forth. On the contrary to this, what should be done is to subscribe to an established and accepted political philosophy and accordingly engage in politics. For this purpose, one can follow capitalism, socialism or social democracy. In practical terms, when we look at the political history of the world, it becomes clear that all these three ideologies have failed in eventually solving problems faced by human societies. But, capitalism has somehow managed to drag itself forward among the rest. Hence, political activists should understand this reality and engage in politics by aligning themselves with a political party following a definite political philosophy without talking about an untenable utopian “partyless” political paradigm.